A few updates for you tonight, some concerning hot-button political issues of the day. You had to know it would be hard for the MTA to escape these. It’s hard to believe that it’s been nearly four years since the MTA introduced cashless tolling on the Henry Hudson Parkway, but here we are. While I had originally hoped this would do away with a major objection to congestion pricing, the MTA hasn’t yet expanded this long-running pilot beyond the bridge over the Spuyten Duyvil. Now we learn why. In a piece illustrative of the zany deals the MTA has to strike with states to which it provides various services, Andrew Tangel explores how gaps in enforcement, particularly with respect to Connecticut drivers, is slowing the process. The MTA, you say, is barred by deals it has with Connecticut from sending collections agencies after drivers who do not pay bills they receive. Although the vast majority have E-ZPasses, Connecticut drivers owe the MTA half a million dollars. Admittedly, this is small change for one river crossing, but it’s holding up implementation at more crowded spots such as the Brooklyn-Battery Tunnel and the Verrazano Bridge. “Until we have legislation in place, it really doesn’t make a lot of sense to do it out at the larger facilities,” Don Spero, MTA Bridge & Tunnel CFO, said to The Journal. The MTA is working to change these arrangements, but Board members are getting restless. “It’s stupid that we’re not doing this,” Staten Island’s Allen Cappelli said. “To have to sit there because you’re using antiquated equipment is insulting.” The pilot meanwhile has been a marked success as 99 percent of cars now travel across the bridge at speeds of 30 mph or more. As the NYPD rank-and-file enter their third week of their unorganized-but-somehow-coordinated enforcement slowdown, transit riders seem to be shouldering the effects of the precipitous decline of “Broken Windows”-style police work. Crime isn’t up underground; in fact, subway crime — as with all city crime — is at a low. But while cops aren’t eying law-abiding New Yorkers these days, they’re also not pursuing those breaking the rules. Below ground, the slowdown has been even more profound. Police Commissioner William J. Bratton urges officers to target minor offenses that could be preludes to more serious crimes. Last week, however, besides the lax enforcement of turnstile-jumping, a highly visible emblem of urban disorder, officers made only one arrest in the subway system in the category of “peddler/panhandler”; none for unsafe riding (down from 68 for the same period last year); none for narcotics (down from 23); and one for a knife or other cutting instrument (down from 18). Drivers think they’ve died and gone to heaven as well as they can now park with impunity. These numbers, and the relative lack of anarchism I’ve seen in New York City lately, raise questions of what exactly constitutes the appropriate level of police work, but that’s part of a larger dialogue. As temperatures drop into the single digits this week, crime is at a low anyway. I’ll keep an eye on this story as it relates to transit riders. It is, apparently, against MTA rules — wherever they may be posted — to lie down in Grand Central, but for the past month, the MTA has not enforced this regulation. As protesters have staged nightly “Die-Ins” to voice their displeasure with the Eric Garner Grand Jury decision, the MTA has not made a move to clear out those who choose to lie down. Now, according to The Journal, the MTA will enforce their rules, and the Die-Ins must stop. The MTA says they’ve reassessed this decision when protestors started placing placards on the ground, but the protestors aren’t convinced. One way or another, I’m surprised at this decision as it seems to be another First Amendment beehive into which the MTA is sticking its hand. I’m no expert on right-to-assembly jurisprudence, but the MTA has lost nearly every free speech case it has faced recently. We’ll see if this goes anyway. On Tuesday, the protesters were still in Grand Central but fewer opted to lie down. Updated (5:30 p.m.): As Sandy’s landfall nears and the wind speeds around the city pick up, the MTA is starting to shut down its bridges and tunnels. The Gov. Hugh L. Carey (nee Brooklyn-Battery) Tunnel is closed, and the Cross Bay Bridge has been shuttered immediately. The Verrazano and RFK Bridges are under a Phase II wind restriction order which limits the types of vehicles and speeds permitted to cross, and the Throgs Neck, Bronx Whitestone, Marine Parkway, Henry Hudson and Verrazano Narrows Bridges will close at 7. New York City has announced that the four bridges under its purview — the Manhattan, Brooklyn, Williamsburg and Queensboro — will close at 7 p.m. as well. The RFK Bridge and the Queens-Midtown Tunnel will stay open for now. That decision is subject to change pending weather conditions. This storm — and the incoming storm surge — is going to get worse over the next few hours. Stay off the roads if at all possible. Flitting across the inbox this afternoon came a missive from the MTA: On Monday morning, Joe Lhota, public officials and Hugh Carey’s surviving family members will gather in Lower Manhattan for a ceremony officially renaming the Brooklyn-Battery Tunnel in honor of the late governor. Instead of a useful name signifying place, the river crossing will be called the Gov. Hugh L. Carey Tunnel. The Carey Tunnel renaming wasn’t unexpected. The dedication was approved by politicians in 2010, and at the time, I railed against the inanities of renaming tunnels and bridges. Does it make sense to spend taxpayer dollars to rename a river crossing or roadway whose name serves a purpose? Once we could take the West Side Highway to the Brooklyn-Battery Tunnel or else we could take the East River Drive to the Triborough Bridge. Now, we can ride the Joe DiMaggio Highway to the Hugh L. Carey Tunnel or ride the FDR Drive to the RFK or Ed Koch Bridges. Does anyone really know where we’re going any longer? 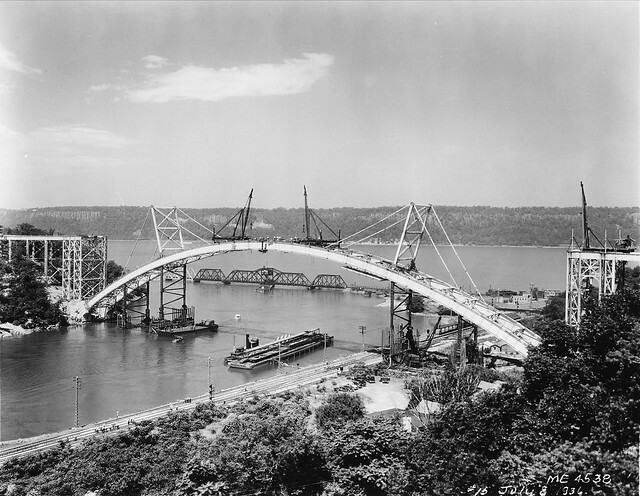 Looking from the Bronx, the final crown piece is placed at the center of the plate-girder, steel arch. New York Central Railroad tracks (now Metro-North) continued operating during construction. The small railroad bridge in the distance belonged to Grand Central Railroad and today is used by Amtrak. Photographer unknown. July 8, 1936. Throughout elementary and high school, I rode over the Henry Hudson Bridge on a daily basis until I started taking the subway up to the Bronx. The span, seemingly forever under construction, is one of the city’s more minimalist bridges with no sweeping suspension cables or iconic brick work. With a northbound upper level and southbound lower level, it simply does the job, and today, it turns 75. As part of its birthday celebration, the MTA is opening up its trove of historic photos for the public to see. Beginning today, the Riverdale Public Library will host an exhibit of more than a dozen Depression-era exhibits of the construction of the bridge and the land around it at the time. The 800-foot bridge, which opened in 1936, was the world’s longest plate-girder, fixed arch bridge at the time and was constructed by Robert Moses in an era when driving was a leisure-time activity. At the time, Moses faced opposition to the bridge mostly from those underwriters who believed motorists would not pay a 10-cent crossing fee with the free Broadway bridge mere blocks away, but the master planner knew that the views of the Palisades would make it a popular crossing for weekend drivers. The lower level opened 18 months later in 1938, and the price tag for the entire bridge was just $5 million. Today, around 63,000 cars per day cross the Henry Hudson Bridge, and the MTA is amidst a $33 million rehab project that will see the original steel curb stringers that brace the upper level replaced. The MTA last year wrapped an $86 million rehab that saw the lower level completely replaced and the pedestrian walkway refurbished. “All of this work is being done to make sure that the bridge remains as strong as it was the day it opened and for many decades to come,” Facility Engineer Walter Hickey said in a statement. It’s a big year for the Triborough Bridge. Now known officially as the RFK Bridge, the three-span structure is celebrating its 75th anniversary this month with a photo exhibit at the Greater Astoria Historical Society and, more importantly, a $1-billion, 15-year overhaul. The bridge, which saw 11 million cars pass through it during its first year of operation, now hosts 60 million vehicles a year, and the overhaul is badly needed. The bulk of the funds will go toward toll plaza work. Design on the Bronx toll plaza reconstruction will start this year with construction to commence in 2014. The Manhattan toll plazas will be overhauled during the MTA’s 2015-2019 capital plan, and that actual roadwork won’t start until 2019. In the eight-year interim, the MTA is going to replace a bunch of old asphalt on the road to prevent water from seeping into the concrete decking. Meanwhile, to celebrate the bridge’s birthday, the MTA along with the Greater Astoria Historical Society will open an exhibit entitled “A Planner’s Dream, an Engineer’s Triumph, a Legacy to our City” at the Quinn Gallery in Long Island City. These images are going to delve into the Bridges and Tunnels photo archive. “This is a perfect way to bring the three communities that the RFK Bridge serves together to celebrate the 75th anniversary of our oldest bridge, which played such a vital role in the development of modern New York City history,” Ferrara said. The Triborough — three bridges, one viaduct and 14 miles of approach roads — cost $60.3 million to construct. That’s just a hair under $1 billion in 2011 money so the overhaul is going to cost nearly the same as it did to build the thing in the first place. Crazy, huh? Updated (1:13 p.m.): As New York City copes with its limited transportation budget and the state of its roads after a very rough winter, the way the MTA allocates funds has come under a small microscope. Yesterday’s Post featured a piece on the state of MTA bridges, and the results were not pretty. “One-fifth of the agency’s spans or their approaches scored below the middle point on the state’s bridge-maintenance rating system,” the paper reported. A more recent assessment of the MTA’s crossings, however, found that all MTA Bridges & Tunnels crossings rated between a 4 and a 6, well within safety parameters. With that in mind, The Post questioned whether or not enough of the $60 million the bridges and tunnels generate per month are being reinvested into MTA crossing maintenance. “You want to keep the bridges from a point where it forces you to change their use, whether it’s changing their load limit or closing them for an extended period of time,” Bill Henderson of the Permanent Citizens Advisory Committee to the MTA, said. Bridge maintenance is covered in the authority’s five-year capital plan, and the MTA will spend over $1 billion on the RFK and Verrazano Bridges alone during the current five-year stint — provided that Albany comes through with the funding. Meanwhile, today, The Post tells us that bridge and tunnel traffic is down by nearly 1 million cars this year. In percentages, that’s a 3.9 percent decline in passenger cars and a 6.6 percent decline in travel by trucks and buses. The MTA — which is short $6.4 million due to the decline — seems willing to blame the fare hike, but I think extremely high gas prices and fewer overall auto trips can’t be dismissed quite so easily. As the MTA has urged more drivers to use E-ZPass, though, trips by cars with transponders has increased by 3.5 percent through April of 2011 as compared with the same time period last year while the numbers of those paying with cash fell by over 17 percent. No longer will E-ZPass-equipped cars have to slow down as they pass through the tollbooths at the Spuyten Duyvil Bridge along the Henry Hudson Parkway. The MTA last week kicked off its cashless tolling pilot in north Manhattan, and to coincide with the new program, they released the video embedded above. For now, the pilot will begin with gateless tolling on the E-ZPass side. Three cash lanes will remain open during the gateless part of the trial, and three E-ZPass lanes will be open for cars. The concept behind gateless tolling is both simple and not a new one outside of the confines of New York City. High-speed equipment can read the E-ZPass devices, and those cars who pass through the E-ZPass-only lanes without an E-ZPass will receive a $50 ticket in the mail. Early next year, the MTA will unveil cashless tolling as well. The camera technology will be in place, and those cars without an E-ZPass will receive an invoice instead of a summons in the mail. The authority says it chose the Henry Hudson Bridge as the pilot for the first-ever fully-automated toll crossing because of its market share. Currently, 85 percent of cars passing over the bridge during the week use E-ZPass, and the ban on commercial traffic on the Henry Hudson Parkway make the pilot easier to manage. For the MTA, this pilot is a big deal because of the impact a gateless and cashless tolling can have on its operations. Without the need to slow down to pay a toll, traffic will flow smoother through the Bridges & Tunnels crossings thus improving car efficiency and reducing emissions. The MTA can reduce its own toll-collection costs as well. On a grander scheme, though, gateless, cashless tolling matters because of the way it disarms an anti-congestion pricing argument. As I wrote in September, one of the main contentions from the anti-pricing lobby concerned surface traffic. By installing toll booths, the spurious argument went, the city would contribute to congestion on local streets leading into Manhattan. Of course, congestion pricing proponents knew that high-speed tolling was a real option, and now everyone will get to see it in action. The anti-congestion pricing congestion argument will disappear right before our eyes. Inspired by the new Holland Tunnel on the west side, civic and business groups began lobbying in the early 1920s for an East River tunnel to help handle a steady increase in traffic at its already clogged East River bridges. The city’s Board of Estimate approved $2 million to design and construct an East River tunnel but plans were put on hold when the stock market crash occurred in 1929. In 1935, President Franklin Delano Roosevelt’s Public Works Administration loaned the city $58 million to help build the new tunnel. Mayor Fiorello LaGuardia created the Queens Midtown Tunnel Authority, which became the New York City Tunnel Authority. That agency merged with the Robert Moses-led Triborough Bridge Authority in 1946 to become the Triborough Bridge and Tunnel Authority. Today, the agency retains Triborough Bridge and Tunnel Authority as its legal name but is known as MTA Bridges and Tunnels and is part of the umbrella of agencies that make up the MTA. Ground-breaking for the Queens Midtown Tunnel took place Oct.2, 1936 with the push of a ceremonial button by President Roosevelt. Over the next three years, the tunnel’s two tubes were excavated using dynamite, drills and four circular cutting shields, about 31-feet in diameter, which were lowered into shafts at each end of the tunnel and hydraulically shoved through the riverbed until they met in the middle. Sandhogs, making $11.50 a day and digging out 18 feet per week, were responsible for the dangerous construction job. As the shields dug forward, the sandhogs had to assemble the cast iron rings that line the tunnel. It ultimately took 54 million manhours to finish the tunnel, and it carried with a 25-cent toll in 1940. That equates to $3.90 in 2010 dollars, but today’s toll has outpaced that. It now costs $5.50 in cash or a $4.57 E-ZPass payment to pass through the tunnel. In its first full year, 4.4 million cars passed through the two-tube tunnel while last year, 27.7 million vehicles did the same. The 6272-southern tube and 6414-foot Manhattan-bound tube underwent a $126 million renovation completed in 2001 that saw the original 1930s brick replaced by asphalt, among other upgrades. Today, the tunnel entrance is a subtle part of Murray Hill while the traffic is anything but. Now a part of I-495, the tunnel’s most famous moment probably came in Men in Black in 1997 as Will Smith and Tommy Lee Jones rode along the roof of the tunnel en route to Queens. As the final piece of the 2011 fare hikes, the MTA Board voted this morning to approve toll increases on its bridges and tunnels across the city. The rate hike targets those who pay in cash over those who use their E-ZPasses, and the authority expects an increase in revenue at its seven bridges and two tunnels of 7.5 percent. The hikes will go into effect on December 30, 2010. The authority board had delayed its vote on the bridge and tunnel increases due to feedback received during the public hearings in September. Originally, the authority had planned a blanket increase across the board, but many commuters and politicians urged the authority to “only cash tolls in order to encourage the use of E-ZPass and thereby reduce toll collection expenses and traffic congestion.” After careful review, the Board decided on a 5 percent E-ZPress increase instead of a 10 percent hike and a $1 cash increase at major crossings. The Board also announced a new plan to expand E-ZPass access as well. Beginning in 2011, the MTA will introduce a card that works similar to a pre-paid debit card. Drivers will be able to reload their E-ZPass accounts with cash using this debit card at hundreds of stores in the region. More details about the plan will be released at a later date. The fare hikes follow. Major crossings include the Bronx-Whitestone Bridge, Brooklyn-Battery Tunnel, Queens Midtown Tunnel, RFK Bridge, Throgs Neck Bridge and Verrazano-Narrows Bridge. The Rockaway Crossings are the Cross Bay Veterans Memorial Bridge and the Marine Parkway- Gil Hodges Memorial Bridge. Could two-way tolling return to the Verrazano? The booths might be gone, but new technology would allow for high-speed tolling across the Narrows. A federal decision in 1986 that effectively eliminated two-way tolling across the Verrazano Narrows Bridge may be reversed if Rep. Jerrold Nadler has his way. As the Downtown Express reports this week, Nadler is trying to get legislation passed that would restore two-way tolling across the Verrazano, and a recent technological innovation by the MTA might just make this plan a reality. Early next year, the MTA will implement cashless tolling on the Henry Hudson Bridge across the Spuyten Duyvil. Using high-speed E-ZPass readers and license plate capture technology, the authority will eliminate all toll gates in a move officials hope will speed up traffic and reduce congestion at the river crossing between the Bronx and Manhattan. If successful — and considering the nationwide use of this technology, there’s no reason to think it wouldn’t be — the authority could move quickly to install it on its tolled bridges and tunnels. Enter Nadler. He wants to use this high-speed, gateless tolling to restore sanity to the New York City traffic scheme. Under his plan, no longer would trucks be able to enter Manhattan for free via Staten Island and leave, for free, via the Holland Tunnel. No longer with unnecessary commercial traffic choke the highways of Brooklyn or the streets of Manhattan. As Streetsblog recently detailed, federal legislation eliminated two-way tolling in 1986, and Staten Island and its representatives have fought hard to keep it that way even though the rest of the city has to suffer. Nadler, who has called for two-way tolls since his early days in Congress in 1992, proposes to halve the one-way toll and enforce the smaller fee in both directions so frequent drivers on the Verrazano Bridge wouldn’t be paying more than they do today. Even as the tollbooths are torn down, this plan is a no-brainer for the sake of congestion, toll revenue and the rest of New York City.